Apple has issued a developer preview for a connector, dubbed the Ultra Accessory Connector, intended to ease connectivity and adapter problems associated with "Made for i"-certified headphones, allowing them to be switched out for USB-C or legacy 3.5-millimeter audio cables. Originally reported by 9to5Mac, and independently confirmed by AppleInsider, the Ultra Accessory Connector (UAC) is a non-symmetrical 8-pin connector measuring 2.05mm thick, 4.85mm wide and apparently half as deep as the symmetrical USB-C and Lightning specifications, and appears to be very similar to the 8-pin connector on a Nikon DSLR camera. For comparison, Apple's Lightning connector is 1.5mm thick, 6.73mm wide, and 7mm deep. The new connector is positioned as a headphone-side connector for both male and female versions. It appears aimed at providing a universal connection point on the headphone side, with interchangeable cables to accommodate a host device, such as Lightning, USB-C, or even a 3.5mm headset jack. Trying to confirm details about the new port, AppleInsider spoke with an accessory maker familiar with Apple's plans, and they noted that they weren't sure what Apple has in mind, what the port would be specifically used for, or how it would be an improvement over anything currently on the market. The developer preview supplied to accessory designers is reportedly light on details, generating some confusion surrounding the port. Lightning does not carry analog audio. 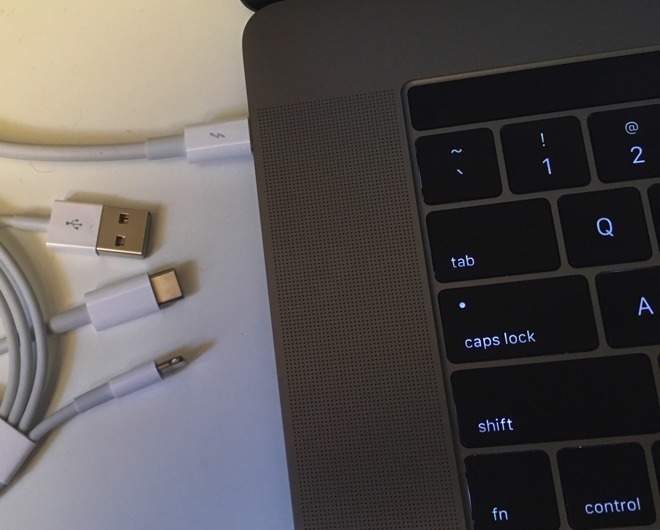 USB-C cables can, assuming that they are compliant with the USB Audio Device Class (ADC) 3.0 standard —but decoding the signal requires a similarly equipped device at the other end of the cable. If the UAC spec is designed to the ADC 3.0 specification or similar, the specification allows for one connector to carry digital audio through a cable with Lightning, either digital or analog audio with a USB-C end, or analog audio through a 3.5mm to UAC cable. The Verge citing sources at Apple, reports that the company has no intention of replacing Lightning or USB-C with the connector. Further, Apple itself told Ars Technica the port is being added at the request of MFi program licensees, not because the company is trying to force adoption of yet another connector.